Mother’s Day is fast approaching and we’re sure that you are running around trying to find the perfect gift for mom. To celebrate all the hard working Mom’s , why not give them a double treat this Mother’s Day! Yes you heard right, and this is how you can give her a double treat and happiness. While placing an order, use the following codes and we will send your Mom the gift for FREE! Offer 1: Use the code offer1mday2013x9y while placing an order for Rs 999/– and above, and we will send your mom Loreal hair fall reduction shampoo and conditioner set for FREE! 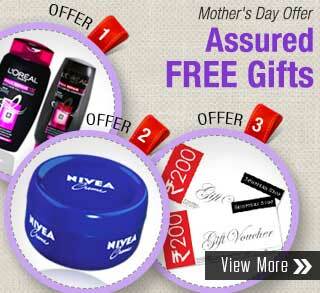 Offer 2: Use the code offer2mday2013x9y while placing an order for Rs.1499/– and above, and we will send a Nivea crème for FREE! Offer 3: Use the code offer3mday2013x9y while placing an order for Rs.1499/– and above, and we will send a Shoppers Stop voucher worth Rs 200/- for FREE! So give Mom the gift of choice and make sure you shop in advance , so we can send your gifts well in time . For more details you can log on to www.tajonline.com. You need to HURRY! We wouldn’t want mom to miss out on this great gift.